Part 1 Economic and legislative drivers for waste management and co-product recovery: Sustainable value stream mapping in the food industry; Economics of food waste co-product exploitation; Regulatory requirements for valorisation of food-chain co-products in the European Union. Part 2 Environmental systems analysis and closed-loop factories: Application of life cycle assessment (LCA) in reducing waste and develop co-products in food processing; Use of life-cycle assessment (LCA) to ecodesign a food product; Closed-loop production for waste reduction in food processing; Step change towards net zero environmental impact in food processing: The closed-loop approach; Water footprint, water recycling and food industry supply chains; Hygienic and sustainable use and reuse of water and energy in food factories; Technologies to reduce refrigeration energy consumption in the food industry; Sustainable food packaging. Part 3 Exploitation of co-products as food and feed ingredients: Enzymes for the valorisation of fruit and vegetable-based co-products; A modular strategy for processing of fruit and vegetable wastes into value-added products; Conversion of fruit and vegetable processing wastes into value-added products through solid-state fermentation; The production of high-value functional vegetable juices from food co-products; Food industry co-products as animal feeds; Vegetable and cereal protein exploitation for fish feed. Part 4 Non-food exploitation of wastes and co-products: Processing of used cooking oil for the production of biofuels; Use of crop residues in the production of biofuel; Carbohydrate-based food processing wastes as biomass for biorefining of biofuels and chemicals; Production of green bioplastics from agri-food chain residues and co-products; Bioadsorbents from fruit and vegetable processing residues for waste water treatment; Recycling and upgrading of bone meal for environmentally-friendly crop protection and nutrition: The PROTECTOR project; Composting of food chain waste for agricultural and horticultural use. This is a most welcome addition to the literature, likely to be essential study material for both technologists and process engineers. Food processors are under pressure, both from consumers and legislation, to reduce the amount of waste they produce and to consume water and energy more efficiently. 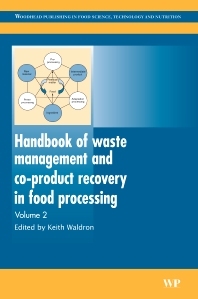 Handbook of waste management and co-product recovery in food processing provides essential information about the major issues and technologies involved in waste co-product valorisation, methods to reduce water and energy consumption, waste reduction in particular food industry sectors and end waste management. Opening chapters in Part one of Volume 2 cover economic and legislative drivers for waste management and co-product recovery. Part two discusses life cycle analysis and closed-loop production systems to minimise environmental impacts in food production. It also includes chapters on water and energy use as well as sustainable packaging. Part three reviews methods for exploiting co-products as food and feed ingredients, whilst the final part of the book discusses techniques for non-food exploitation of co-products from food processing. Keith Waldron is Research Leader and Director of the NRP Biorefinery Centre at the Institute of Food Research, UK.